Now into our 13th year and fast approaching our 50th meeting, we are pleased to announce that 2018 will as always see a great set of quarterly meetings to be held in various central London locations. In order to encourage as many people to attend as possible our meeting are free for all to attend, there are no membership or registration fees. Meetings consist of a plenary lecture followed by four twenty-minute talks including a student presentation. The emphasis of the talks is to promote discussion, present problems and highlight topical issues and there is plenty of time between talks for debate. With the help of our sponsors we provide a free buffet lunch and a wine reception allowing ample time to mull over the talks and network. We are always open for suggestions on the content of meetings and if you would like to present, provide sponsorship, a venue or have any questions about our group please feel free to get in touch via email. 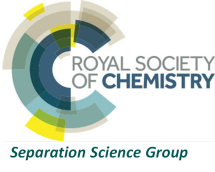 In 2015 the LBMSDG connected with the Royal Society of Chemistry’s Separation Science Group and we were pleased to announce that the best student talk in 2018 will also carried a £400 prize! The winner of the 2017 prize was formally announced at the March Meeting. Details to follow.